Domus Ciancaleoni New Red Suite 1st in Quality and Service. Not in Prices! Mostly Domus Ciancaleoni Apartments are 1st Category. The RED Suite, 55 square meters., Is probably one of the best. Everything is perfect, top quality, elegant and with a strong personality. You can reach it by an outdoor stairway (1st level) from the old Court, or with an elevator. It offers a large living witha comfortable double sofa - bed, a dining corner - kitchen fantastically equipped. A double bedroom with a queen bed and 2 bathrooms. One with Jacuzzi. the other with a shower cabin. Both are with travertine marble where you can enjoy listening to music through sonorous spreading system. While staying in the RED Suite you'll enjoy the absolute quite two to the absence of traffic. Although in the heart of the old Rome you may feel like living in the country. One of the windows is on the little old court of Palazzo Ciancaleoni, Which is decorated by two authentic Roman Capitals. And under your bed ... .. there is an authentic Roman Domus built in the Ist Century Before Christ. Of course WiFi, TV, Air conditioning. PLEASE, IF YOU FIND SOMETHING INTERESTING FOR YOU, IT WOULD BE BETTER IF YOU BOOK EN IN ADVANCE AND WHEN YOU WILL ARRIVE TO DOMUS CIANCALEONI, ALL WILL BE READY AS YOUR DESIRES. Via del Ciancaleoni in the Monti quarter, the Archaeological Superintendency of Rome, ordered to be undertaken in the basements. The removal of the modern debris (datable to between the first Decades of the 20th century and the present) inside the cellars accessible from No. 46b revealed Numerous rooms in opus reticulatum with barrel vaulted roofs. These were part of a late Republican house (domus with atrium and peristyle). More rooms of the samedomus together with others from an adjacent house, accessible from via Cimarra No. 37, were investigated in 1969-70 by V. Santa Maria Scrinari and published by A. M. Ranieri. The 2007 investigation Thus provided a fuller picture of the residential complexes covering an area of ​​approximately 700 m2. It was possible to distinguish the earlier house (about 50 BC) Which was flanked by the second domus around the beginning of the second half of the 1st century BC The latter was caratterizzata by two parallelcryptoporticus between Which there were a series of symmetrical rooms mirrored by a second series. During the 1969-70 investigations the remains of wall paintings in the II style Emerged together with mosaic floors. Both dwellings, Which constituted a sort of terracing on the hill slope, were on an east-west alignment and at a right angle to the way Patricius. The location, size and state of preservation of the structures anche made it possible to put forward a number of hypotheses Regarding the urban development of Rome near the eastern slopes of the Viminal in the late Republican and early Imperial periods. At the end of the 1600s or the beginning of 1700 and that part of the structure were used as a wash-house in the modern period. For check in after 9.00 pm we ask for € 20 extra. For check in after 11:00 pm we ask for € 40 extra. WARNING: Two to the fact that "DOMUS CIANCALEONI" is in the Center of Rome, WE STRONGLY SUGGEST NOT TO COME WITH A CAR. Two jazz clubs within walking distance, as well as restaurants, coffe shops and ice cream. However, the place is not handicap accessible. Make sure you get an explanation of how the air conditioning works, as the owners are not always accessible. The kitchen is very well equipped. Silvia is an excellent hostess; warm and helpful. Had we more time, I am certain we would have been able to benefit more from her guidance. Unfortunately, because our phone 'died' it caused us some difficulty in communication and verification.. We hope she forgives us for any unintended consequences. 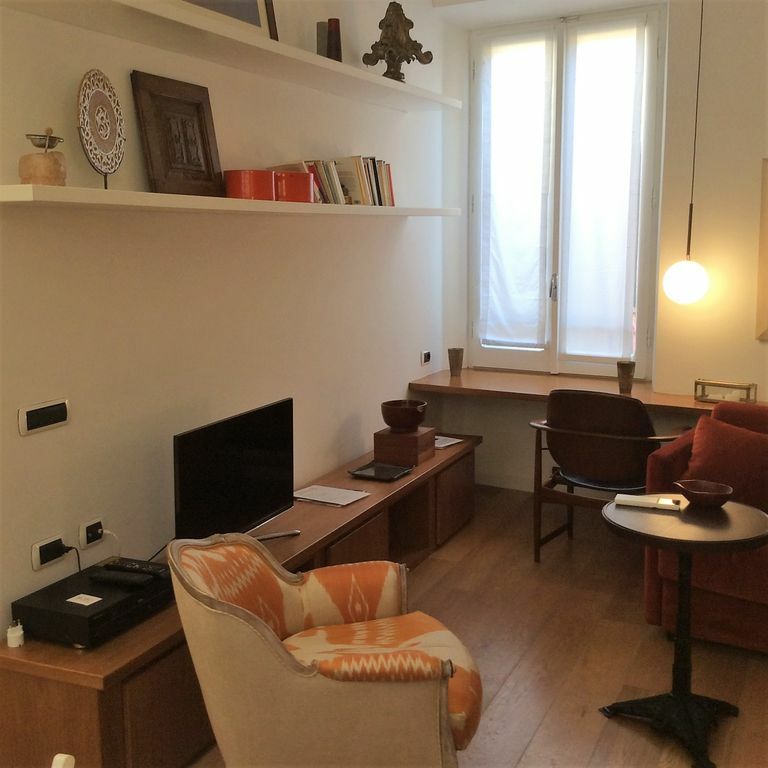 We would highly recommend her apartment to anyone visiting Rome! My son and I had a wonderful time in Rome. The apartment is in the downtown of Rome right near the Colosseum. There was plenty of room in the apartment for the two of us. Fantastic restaurants are right around the corner and we were in short walking distance of the bus stop and the Metro stop. We walked to the Pantheon, Trevi Fountain and the Spanish Steps. Joel and Sylvia were both extremely helpful and answered every question we had. They even arranged car service to and from the airport for us. Thank you so much for helping to privide a most memorable vacation. Beautiful property in the historical centre of Rome. This place is a gem hidden away in Rome. The most flexible and welcoming host (Silvia) made our stay relaxed and comfortable from initial booking through to check out.